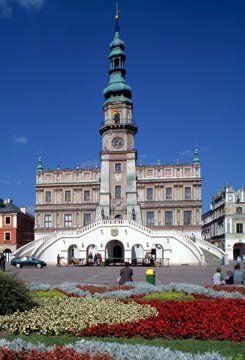 Zamość is also exceptional by the fact that no other 16th century European town is so homogeneous in its spatial configuration. Furthermore, it bears testimony to the particular harmonious coexistence between the culture influences of the Western and the Eastern Europe. 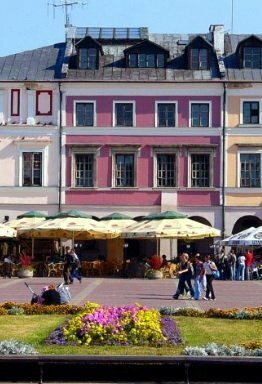 Thus, since the beginning, Zamość has been the multi-culture town due to the fact that the founder allowed the Italians, Germans, Armenians, Greeks and Jews - to settle here. 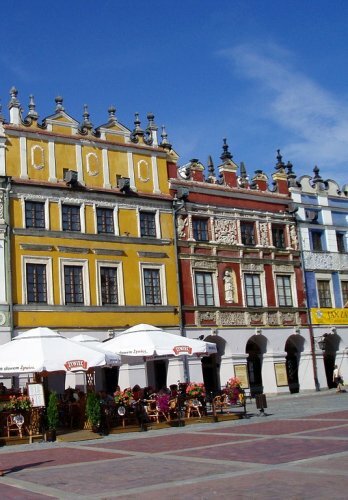 That is why Zamość structural design is full of variety without losing its regularity. Finally, the original layout of the Old Town (including its outstanding street pattern and three market places) - full of logical harmony and organics links, as well as the architecture within the defense wall, are well preserved to its day, in spite of partial demolition and some alterations introduced over the centuries. Zamość was founded in the year 1580 by the Chancellor and Hetman (head of the army of the Polish-Lithuanian Commonwealth) Jan Zamoyski, on the trade route linking western and northern Europe with the Black Sea. Modelled on Italian trading cities, and built during the Baroque period by the architect Bernardo Morando, a native of Padua, Zamość remains a perfect example of a Renaissance town of the late 16th century, which retains its original layout and fortifications (Zamość Fortress), and a large number of buildings blending Italian and central European architectural traditions. 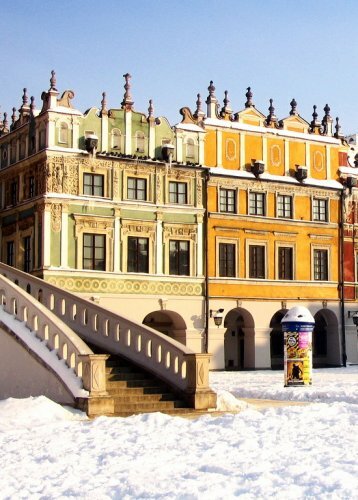 The Old City quarter of Zamość has been placed on the UNESCO list of World Heritage Sites. In 1942, Zamość County, due to its fertile black soil, was chosen for further German colonisation in the General Government as part of Generalplan Ost. The city itself was to be renamed "Himmlerstadt" (Himmler City) and the German occupiers had planned the relocation of at least 60,000 ethnic Germans in the area before the end of 1943. Before that, a "test trial" expulsion was performed in November 1941, and the whole operation ended in a pacification operation, combined with expulsions in June/July 1943 which was code named Wehrwolf Action I and II. Around 110,000 people from 297 villages were expelled. Around 30,000 victims were children who, if racially "clean" (ie. had physical characteristics deemed "Germanic") were planned for germanisation in German families in the Third Reich. Most of the people expelled were sent as slave labour in Germany or to concentration camps. Local people resisted the action with great determination; they escaped into forests, organised self-defence, helped people who were expelled, and bribed kidnapped children out of German hands. Until the middle of 1943, the Germans managed to settle 8,000 colonists, the number increased by a couple of thousand more in 1944. This settlement was met with fierce armed resistance by Polish Underground forces. The current President of Germany Horst Köhler was born to a family of German colonists in Skierbieszów. 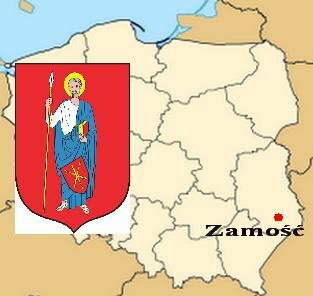 After World War II, Zamość started a period of development. In the 1970s and 1980s the population grew rapidly (from 39,100 in 1975 to 68,800 in 2003), as the city started to gain significant profits from the old trade routes linking Germany with Ukraine and the ports on the Black Sea. 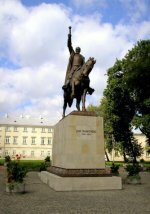 Noted conservator and artist Professor Wiktor Zin was responsible for the design and oversight of conservation work on the Arsenal and the Armenian quarter in Zamość.